This is the next in the series of Tech Talks on Coal Mining, and I’m now going to move more into more recent mining, rather than dealing with the historic background of the recent past. Specifically I am going to describe how the “Bord and Pillar” mining of the olden days transitioned into the much more mechanized mining method, known as “Room and Pillar” mining – the most popular method of mining in the underground mines of the United States. To briefly review where we have been, coal has been mined for centuries. It is usually found as a relatively flat layer of soft rock, often under a layer of relatively soft shale, and just above a second layer of shale. These then form the roof and floor of the tunnels, or headings, through which the mine is developed. Because the shale is often softened by water, this can pose longer-term problems. But one can, simply, think of coal as being the layer of cream in the middle of a cake. And one of the tricks is to carve out the cream without the top half of the cake falling on your finger. In earlier times it was, unfortunately too often a method of widen ‘til it falls. 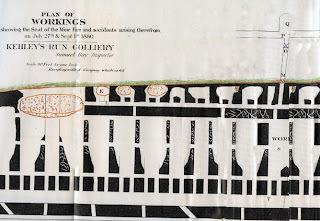 The most common method of mining started with driving tunnels, and then intersecting these with “cross cuts” through the pillars of coal left to hold the roof (the top half of the cake) in place. As I showed in an earlier illustration (above), since it was easier to mine from free faces then the solid, the initial rooms driven were often widened, until the roof fell in. And, over time mining practice came to narrow those initial tunnels to around 10 – 15 ft in width. They were initially smaller, when hand won, but with the advent of more mechanized mining the width grew greater, and required more support in the tunnel itself to hold the roof immediately above. At the same time, as the mine workings moved away from the shaft (which took coal out of the mine, but also supplied fresh air to it) it became more critical to steer the air entering so that it reached the working areas of the mine, and then could be sent back to the surface. Without that proper circulation of air, the gasses which the coal would give off, including methane (natural gas, carbon dioxide and carbon monoxide) this could well be fateful. And so the miners began to also build temporary or permanent “stoppings” or walls across some of the abandoned tunnels to steer the air currents down the tunnels in and out of the working area. 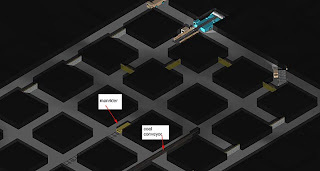 To separate the two flows (in and return) between the main roadways permanent “airlock” types of walls would be built with doors between so that one could cross from one passage to the other without interfering with the passage of the air. Stoppings and an "air lock"
As the mines developed miners learned, sadly the hard way, that just having one shaft or access into and out of the mine was not safe. A major accident occurred at New Hartley in Northumberland, UK in 1862 where the main beam for the dewatering pump fell into the shaft, blocking it. The 204 men and boys in the mine, virtually the entire working male population of the village, were all killed, It was a result of those deaths that legislation was passed that required that there be two separate ways to get out of a mine. Where the mine is deep underground this means that there are generally two shafts, or more from the workings to the surface. As a small piece of family history my father was manager at the successor to that mine, New Hartley, shortly after I was born. There was also a novel of the disaster, sadly out of print, called “The Darkness in the Morning” by Gordon Parker. It tells of the different pressures on the miners, the management and the owners to survive, and how, in part, some of those decisions led to the disaster. But air does not move by itself. There has to be some form of power applied to move it, and before there was electricity there was heat. So, if you have two shafts then at one stage, to power this air circulation, they would light a fire at the bottom of a shaft, and this would draw the air to it, and from the mine. It was given the name furnace draft ventilation. 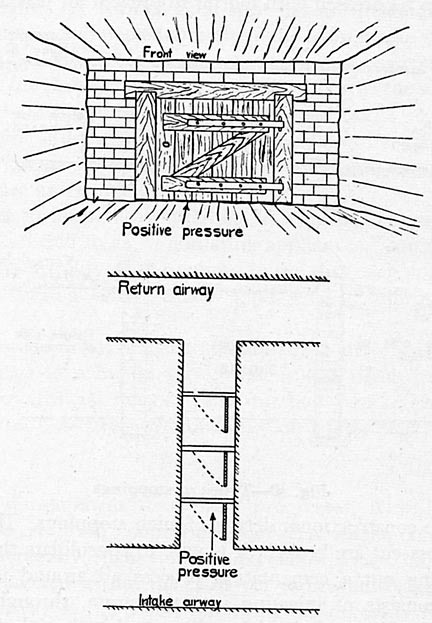 In other cases the shaft was divided, with fresh air going down one side, and the heated return air going up the other. 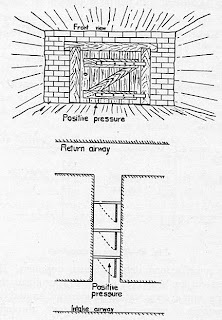 Air shaft (known as an air funnel) from an underground furnace ventilating a mine in 1877. Once the air was moving into the mine it would toward the workings as Intake air, or fresh air, travelling down the main transport tunnels or drifts to get there. The worked out rooms on either side would be blocked off permanently, until the working area was reached. Here the air had to circulate across the rooms that were being mined, and then, since this air would now contain the gases and dust released from the mining process, it would be moved by temporary stoppings to the Return air passage, and thence out of the mine. Initially men broke the coal from the solid with picks. When they worked this efficiently, a man can be very effective in breaking out the coal (about 4 joules/cc specific energy, for those that are interested.) The machines mine at around 1,000 joules/cc of coal removed). But man is slow, and so the manual pick was replaced with a mechanically swung version. 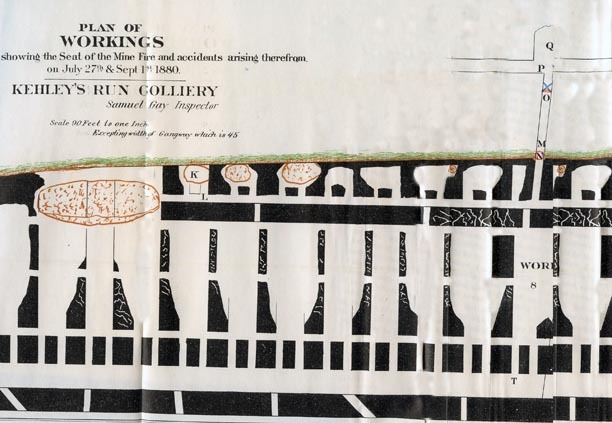 Initially a large number of picks were set into a chain, rather like a large chain saw, and this was used to undercut the coal seam about a hundred years ago. 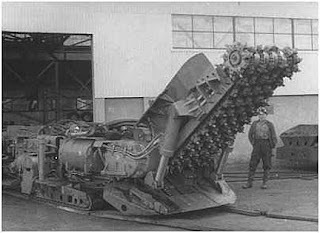 Then holes were drilled into the coal above the slot, filled with a stick of dynamite, and the blast would break the coal into pieces, that the miner could load into tubs. From this came the idea of putting lots of these chains together to form a belt, wound around a rotating drum, that would grind away coal all across the face, without the need for the explosive. 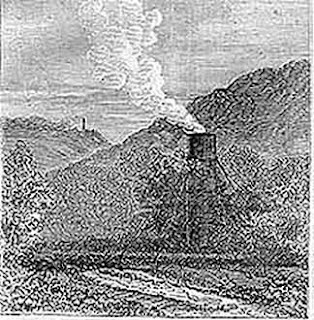 In other words the coal could be won continuously, without stopping to clear the explosive gases, It was found that the picks did not have to be right beside one another but could be spaced, and this was the birth of the modern continuous miner. 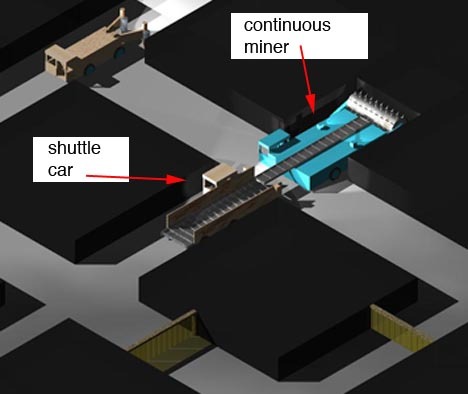 (The pictures that follow were generated using Strata 3D and portray, a simplified view of the parts of a working section of a relatively modern mine starting with the continuous miner). The continuous miner grinds the coal ahead of it as it moves into the solid carving a tunnel or heading as the coal is removed. You might note that there is a protective cab at the back of the machine. 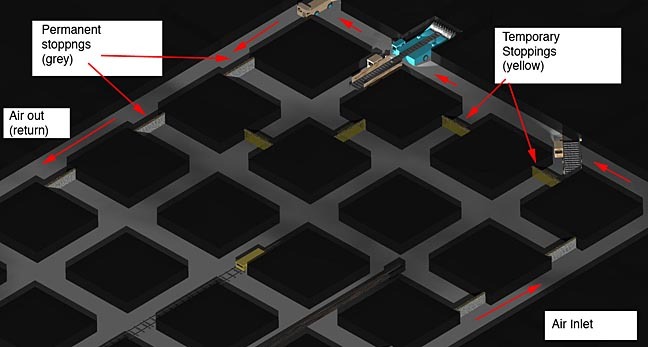 The machine can only go forward until the miner is under the last row of roof support. The machine must then back out of the heading, and move over to a second heading while the section that has just been mined is supported. At the same time the coal is being loaded from the conveyor onto a small shuttle car that will move the coal from the heading to the nearby continuous conveyor belt. The picture shows the continuous miner starting to drive a heading while loading coal into the shuttle car behind it. (I have not shown the power cables or, people). 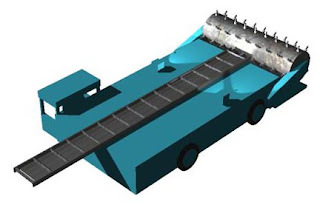 Normally a section may have two or three of these cars, so that while one is carrying the coal from the continuous miner to the main belt conveyor transfer point, the second can replace it and catch the next batch of coal to come from the machine. In the heading above that being driven there is a machine with two drills on extensible booms. This is the roofbolter. (Note that the seam is about 6 ft thick in the model and I have taken away the roof so that you can get an idea of the layout, which is shown from above. (I’ll discuss how one holds the roof up in a later post.) The shuttle car can brush through the temporary stoppings, which I have shown as plastic hanging curtains. At the transfer point the cars dump their load onto the protected end of a long conveyor belt that will carry the coal to the shaft, where it is loaded into skips that carry it to the surface. Where the seam of coal comes out to the surface on the side of a hill (outcrops) the conveyor will come out through one of the entry tunnels (portals). In the picture you can see that in this district or section of the mine they are driving five headings, with the miner in the second. There are two shuttle cars, one at the machine and one turning to replace the first along the cross-cut. The conveyor belt is in the fourth drift, while in the third, or central heading is the man-trip that carries men and supplies to the section, and the light rail segments that it runs on. (I have not shown the supply piles and other items normally found around this area). The problem of gas is still present, as it was years ago, and because the coal is ground into smaller pieces (most of it less than an inch in size -while hand-got coal was around four inches), the gas volumes can be somewhat larger than with slower methods. 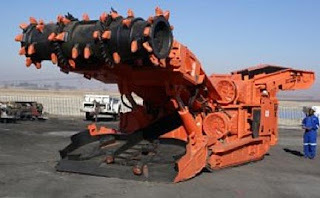 The continuous miner can achieve short-term production rates of around 15 tons a minute, but must stop frequently to change cars, or to move. The problems of ventilation remain. Large fans at the surface now supply the air to dilute the gas and sweep it away. In the immediate working area these stoppings can be made of cloth or plastic, so that miners can more easily move through them. When the working area moves on the stoppings are made permanent, and the ones shown are made of grey cinderblocks. Doors are placed in these stoppings at regular intervals to allow men and machines to pass, as shown above. Remember that in most of this area, all the miners have to see where they are going are the caplamps that they wear on their helmets, or the floodlights on the machines. It is still necessary to leave pillars to hold the roof up. Roads, headings and cross-cuts are often the width or some multiple of the width of the mining machine, i.e. generally around 12 - 20 ft. based on the seam depth and the roof rock strength. Pillars may be around 40 ft on each side. It doesn't take long to realize that a lot of coal is being left in the ground. That will become the subject of later posts. For those who know better, please recognize that this is a very simplified explanation of Room and Pillar mining, and that there will also be a few more details, as this series continues. But it should convey the concept.